Soon the dark winter nights will arrive and with that comes a chance to have a great night out as the Burnavon, Cookstown releases its new autumn/winter season programme full of new theatre performances, events, exhibitions, and workshops for everyone. As always, music of a variety of styles is a strong feature in the programme. With appearances by a galaxy of Country stars, including Nathan Carter; super group, The Bjorn Identity; the internationally renowned Phil Coulter; and folk legends, Foster & Allen and The High Kings, there’s something to cater for all tastes. There are plenty of laughs to be had this season with local and international stand-up from award winning comedian William Caulfield, and local funny-man Tim McGarry, who takes a fresh and irreverent look at the year of centenaries. A dramatic highlight of the season is ‘The Shadow of a Gunman’, performed by Pomeroy Players and written by Sean O’Casey in 1923. We stay with classic Irish drama, as later in the season John B. Keane’s ‘The Matchmaker’ takes to the stage. For their fabulous new production, Ballet Ireland presents a classic production of The Nutcracker. With its classic costumes, its captivating dance and charming music, this ballet will enchant and enthral audiences of all ages. Exhibitions take a look in the past in September, as the styles of yesterday are explored, and a nod to the future in October, November and December, when innovative fashion design and emerging local artistic talent from our local schools, Holy Trinity College and Cookstown High School, is showcased. With stand-up comedy, drama, family entertainment, a new series of workshops for adults and children, where you can learn to jive, or make your own all natural candles, and brand new make-up masterclasses, and of course, the eagerly awaited annual Stewartstown panto, directed by Brian Morgan, there’s sure to be something to brighten up the dark autumn months at the Burnavon. 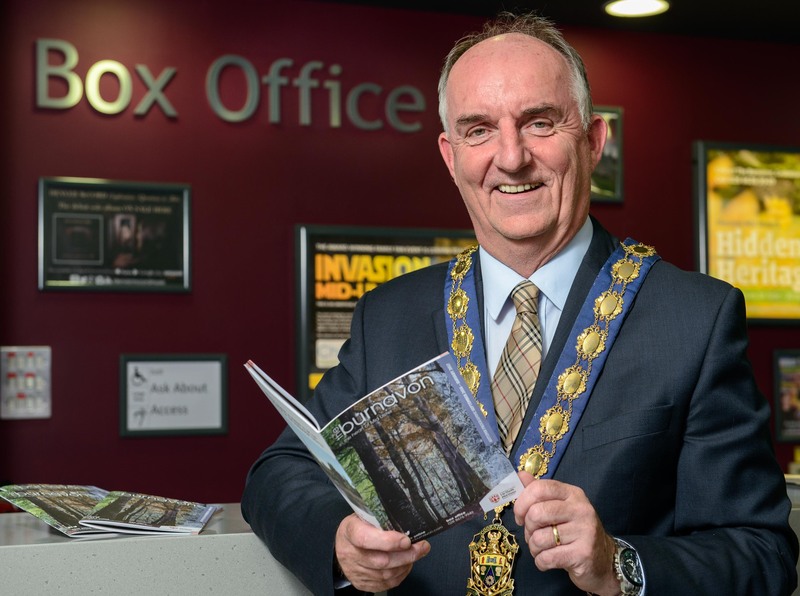 Speaking about the new programme, Chair of Mid Ulster District Council, Councillor Trevor Wilson, said, “The new autumn/winter programme for the Burnavon, Cookstown is jammed full of activities to suit all ages and interests including musical and dramatic performances, comedy shows, exhibitions and workshops. Photo Caption: Chair of Mid Ulster District Council, Councillor Trevor Wilson pictured with the new autumn/winter programme for the Burnavon, Cookstown.